Moscow has harshly rebuked the latest NATO attack against forces loyal to Libyan leader Muammar Gaddafi, saying that the Western military bloc has given the militant opposition “dangerous ideas,” while stoking the flames of unrest elsewhere. NATO forces have unleashed a powerful missile attack on Tripoli, the Libyan capital, in the latest sign that the coalition has ignored its UN mandate to “protect civilians” and has chosen instead to take sides in the revolt. 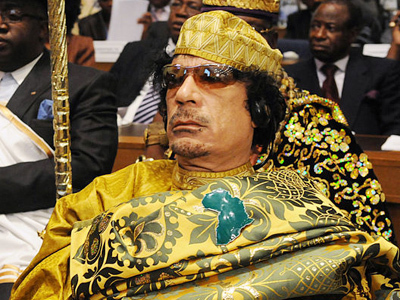 As recent actions would indicate, NATO forces have opted not to side with Libyan strongman Muammar Gaddafi. Early reports on Monday said at least two cruise missiles had slammed into Gaddafi’s sprawling Bab al-Azizia compound, which seems to be the same location where the Libyan leader recently hosted an African Union peace mission. Libyan media reports say the compound did not have a military component, nor was it in any way endangering civilians, thus NATO violated its UN mandate, which was specifically designed to limit the number of civilian casualties. 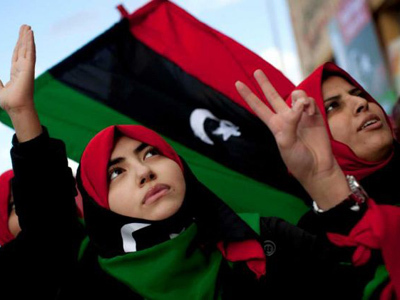 The early-morning attacks came as pro-Gaddafi forces were retreating from Misrata, a rebel stronghold in western Libya that has been the scene of fierce fighting between the rebels and pro-Gaddafi forces. According to eyewitness reports out of Libya, the rebels received heavy back-up assistance from NATO fighter jets, as well as the United States, which carried out its first Predator drone airstrikes Saturday afternoon, Pentagon spokesman, Navy Captain Darryn James, said. The UN resolution, which enforces a no-fly zone, does not imply air raids, including strikes on civilian sites. "Yet there have been reports to that effect," the foreign minister observed. The Pentagon, meanwhile, invoking its claim to military secrecy, offered no other information on the aerial attacks. 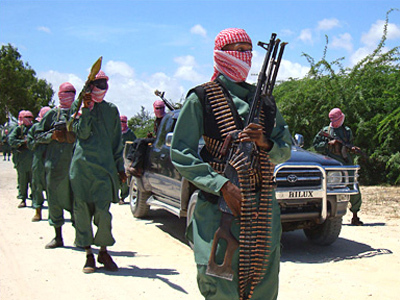 Meanwhile, the ragtag rebels received a cash pledge on Sunday from the government of Kuwait for the creation of so-called Transitional National Council to the tune of some $180 million. Moscow has harshly criticized the actions of the Western coalition and their partners, arguing that NATO is abusing its UN mandate while hardening the resolve of the rebel opposition, of which dangerously little is known. "We suspect that their [insurgents'] irreconcilability is rooted in the fact that Western and NATO countries, which volunteered to fulfill Resolution 1973, have taken the side of the insurgents,” Russian Foreign Minister Sergey Lavrov told a press conference on Monday in Tskhinval, South Ossetia. Lavrov said that NATO’s actions were causing the insurgents to become overly dependent upon “foreign help,” which they might translate into their ability of overthrowing the regime and taking power. “These are very dangerous ideas," the foreign minister said. Just last month it was reported that Al-Qaeda militants had infiltrated the ranks of the Libyan opposition for advancing their own agenda. Moscow promptly warned that any assistance to the government opposition could unwittingly become synonymous with assisting terrorist organizations. Lavrov said that NATO’s rush to assist rebel leaders may give a dangerous message, and actually help foment civil war in other parts of the world. "Alas, [the message] may be contagious, because it is expressed in other regional countries with the hope that the international community will come to their assistance if the situation exacerbates." "In fact, this is an invitation to a series of civil wars," he said. Along these lines, Lavrov stressed that it was counteractive for “external players” to take a particular side in any political altercations, which the opposition may use to their advantage. "I hope that the trend of rejecting negotiations will be actively put to an end by anyone capable of influencing either side to the conflict," he said. 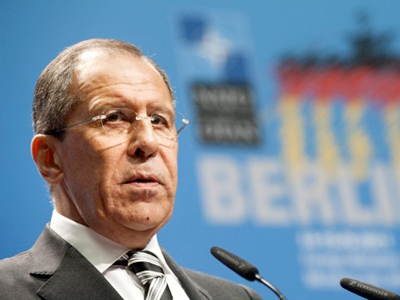 "We will insist on the prevention of [bringing the hostilities] to a dangerous phase,” Lavrov concluded. “It is important to ensure strict compliance with the UN Security resolution on Libya, whose mandate does not imply a lot of things, which are being done in the air [raids]." 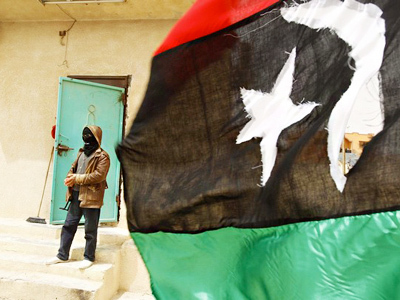 The mass uprising against Colonel Gaddafi began in February, triggered by a wave of uprisings throughout the Arab world.